Twas the night before the night of Christmas and everything was stirring, the dogs were barking and girlfriend and I were debating about what I could cook for the Christmas lunch that was a coming. ‘Make a salad’, she suggested. I don’t understand vegetables I replied, they confuse and confound me. I’d rather do a spaghetti marinara; but it’s too cumbersome to carry. 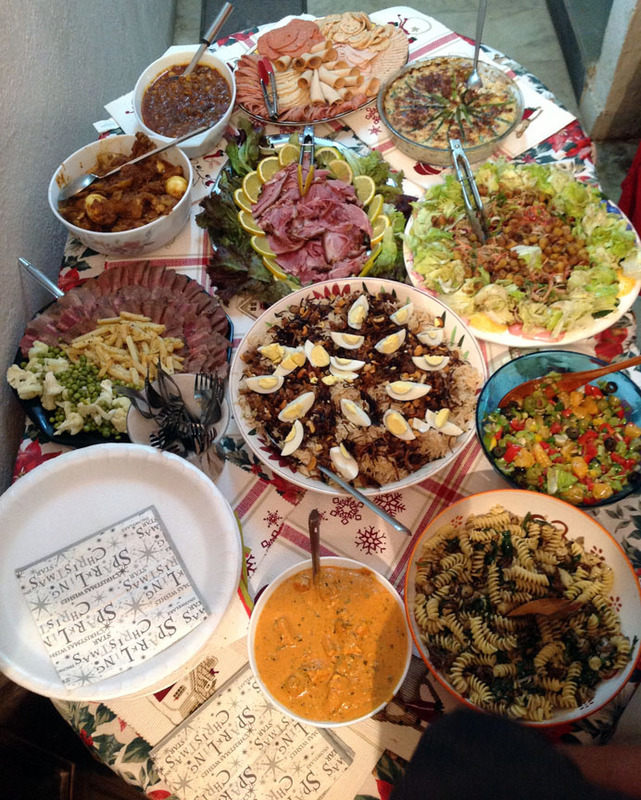 ‘Make a salad,’ she reiterated. Do something different! I grudgingly conceded and started hunting for a recipe that was easy, interesting, could be prepared the night before and was easy to transport. After rummaging through several cookbooks and many a I website I found this recipe which I decided to adapt. I added a touch of butter for a bit of richness and the garlic for a punch of flavour. Turned out to be quite a hit. The key to this recipe is using good ingredients; if you don’t use a good quality pasta and olive oil it’s not going to turn out well. Also it’s advisable to use a strongly flavoured dried mushroom; however avoid black mushrooms the flavour is too overpowering while oyster mushrooms are too mild. I’m not sure which mushrooms I used, they were a gift with no label, but I suspect they were dried paddy straw. Soak the mushrooms in hot water for about 5 minutes. Remove once the mushrooms are hydrated and dice. Reserve about 2 tbsp of the soaking liquid. Separate the caps and from the stems of the button mushrooms. Slice the caps thinly and finely chop the stems. Cook the fusilli in boiling salted water for about 8 minutes or till al dente. Meanwhile, heat the butter and olive oil on a medium flame. Add the garlic and cook for about 2-3 minutes or till soft. Add the chopped and sliced button mushrooms, stir well and continue cooking till the mushrooms start to release water. Stir in the chopped dried mushrooms. Toss well. Lower the heat and continue cooking. By this time the fusilli should be about done. Remove from fire, drain, but reserve about 3 tbsp of the water. Raise the flame to high. 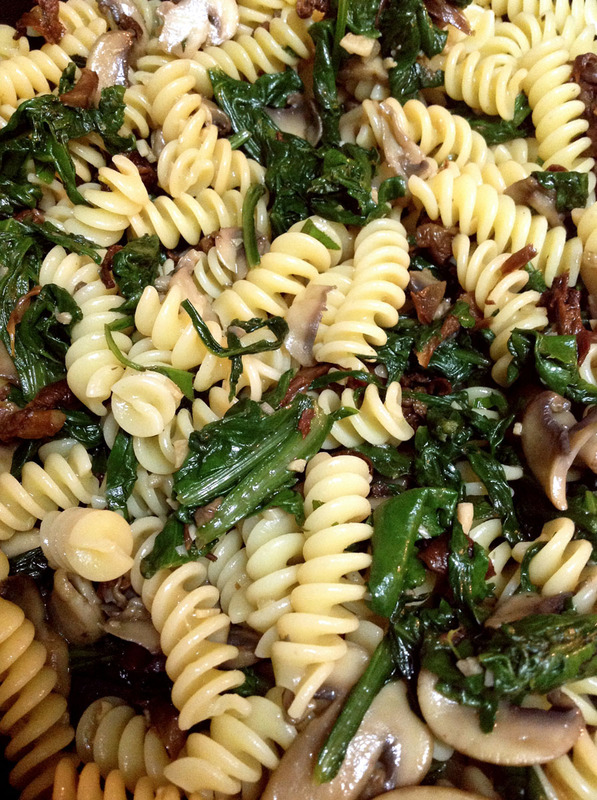 Add the hot fusilli, spinach, salt, and reserved pasta and mushroom waters. Continue cooking for about 2-3 minutes tossing to ensure that the mushroom bits and garlic get caught in the fusilli spirals. Add the fresh thyme and pepper and remove from heat. Pour the extra virgin olive oil to finish. Can be eaten hot, but tastes better cold as a salad.